I still have white tongue and am still get a fuzzy mouth. I had a bit of a headache today for about 30 minutes. It was pretty low grade and i was easily able to work thru it. I am the same weight as i was yesterday, which is a 7.5 pound loss since March 1st. I was a sleepy head today. I slept until 10 (which is really 9 with the time change). I slept a total of 9 hours. I woke up at 7 and felt ok, but wanted a little more rest, 3 hour later, i woke up feeling pretty good. I could not hold my focus at all today, and just wanted to stare off into space. I had no motivation, no energy, and no focus. I did not get hungry until almost noon. 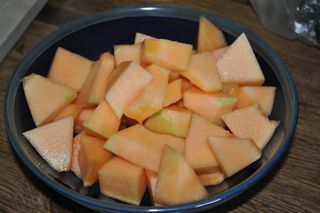 I had a couple plums, then half a cantaloupe. I love that my diet has all these colors in it. After a couple hours, i wanted more fruit. 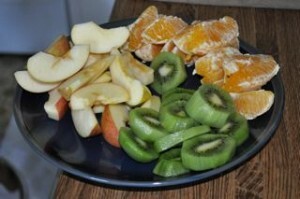 I made myself a fruit plate with kiwi, orange, and apple. Towards the early evening, i craved something heaver. I thought about making the cucumber goodness again, but all i really wanted was avocado and tomato, so i gave into the craving instead of trying to force it into what i thought it should be. I made myself an avocado with 2 tomatoes. The first tomato i ate like an apple. It was a fun experience!. I added 2 more tomatoes to my plate, and they really hit the spot. About an hour later, i went back for seconds of avocado and tomato. For a dinner, i had a green smoothie (strawberry, banana, spinach, maca). 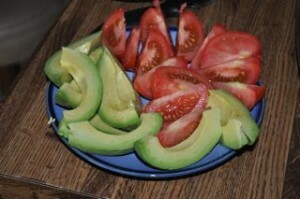 Eating raw food is getting easier and easier. I’m not sure my detox is through and I’d still love to run out and grab Chipotle, but it is getting more habitual. I discovered that one of the things that was really missing for me was salt. Prior to going raw I put salt on 70% of the things that I ate and an additional 20% had salt in it already. So switching to raw seriously cut down on my sodium intake. While this is not necessarily a bad thing, it was definitely something that was making raw a bit more bland. Since I’ve realized that I missed salt so much I’ve started to have tomatoes with pepper and raw salt on them, which makes me a happy camper. The other benefit to this snack is that it is something that I ate on my old diet, so it brings back some familiarity to my food choices. I noticed that I am becoming less structured around my eating, and by this I mean that I am snacking/grazing more and not having as many regular meals. I think the cause for this is because my cooking – well, I suppose not cooking – but preparing raw food is still not something that is natural for me, nor do I have a large repertoire of meals from which to choose. Also, the foods that make me feel the fullest and, therefore, are consumed more often are fruits that do not require much preparation. In terms of how I am feeling, I am beginning to feel better. I’m still sleeping more than usual and I do not think my detox has finished it’s course. But here’s an interesting note, while I still miss some of the old foods, my cravings are not so much for the take out anymore, but rather for the home cooked meals that I liked to cook, taco salads, beef stroganoff, pasta, eggs and the nest, cookies, and chili chicken with a honey glaze. I am curious to see how the cravings will shift down the line, as we are not even a third of the way through the 30 days. The good news is that with each passing day I am more confident that I will last the 30 days (on days 1,2, and 3 I wasn’t so sure.). We still haven’t gotten to the bottom of my stomach issues, but in regards to the cucumber observation, I think I’ll continue to stay away from them for a bit longer. There are a few things that have come up that I hadn’t thought about or that were different than I anticipated. The first, is cost. As Adrienne stated we (okay, okay, primarily Adrienne) are researching this to see how sustainable it is and to see if maybe there are somethings that we could do differently. The second, is garbage. We used to take the trash out once a week; it would be full, but it didn’t need it more than that. Now, the trash is heavier, wetter, and gets smellier faster, therefore, requiring more attention. Not a big deal, but worth a mention. Engineers…where would we be without them. This entry was posted on Monday, March 9th, 2009 at 2:44 am	and is filed under Raw Food. You can follow any responses to this entry through the RSS 2.0 feed. You can leave a response, or trackback from your own site. Those are yummy fruit pics!